Safety, speed, action, thrill, and excitement are the key attractions of the best electric skateboard you can find online today. The Acton Blink S2 has three unique modes of functionality namely the beginner, normal and the professional. The dual hub motors onboard the skateboard provides optimized traction for you to get better grip while riding. With a maximum weight support for 250LBs, the skateboard is made of aircraft grade aluminum in combination with the maple wood imported from Canada. The Dimension (31.5” LX 8.5” W) of the board gives maximum standing space for you with good foot grip on board. The remote control allows you to vary the speed according to your need. The maximum speed limit of the board is 18MPH on standard road conditions. The dual hub motor shells contain strong set of inbuilt magnets around its core. It has a strong bearing, supported by a washer and six screws. You can get better control over the board at all the speed levels. Maximum Speed: Unlike the standard skateboards, the Acton Blink S2 can travel at maximum speed when the battery charge is on the higher or lower range. The reason is the wattage and throttle control capacity of the battery output and the motor shell. You can use the throttle properties to accelerate the motor to variable speeds, from the minimum of 1MPH to the maximum of 18MPH. Reverse Motion: The switchover from forward to reverse motion happens very shortly after you change the direction through the remote button. The core of the motor shell is built to absorb the shocks from the friction and balance the board without any swaying. You will be able to move in the reverse direction with the same smooth flow, by maintaining your body‘s equilibrioception. The battery of the Acton Blink S2 extending beneath the board is placed between the bottom aluminum section and the top maple wood section inside the deck. Recharge & Run Time: The battery recharges within 2.5 hours from the standard AC power source. The running time of the battery is 90 minutes (approximately 13-14 miles). The battery charging happens fully within this span of time. Battery Capacity: The Acton Blink S2 battery capacity is 36V (4.4AH). Make sure you don’t use the battery until it drains out. The probability of damages to the battery is more during such times. Battery Connectivity: The battery connectivity is with the two front side Hub motor wheels. The upper part of the Acton Blink S2 deck is made from Maple Wood originating from Canada. For the other skateboard made of Maplewood, you can read reviews on the Acton Blink Board. The tougher wood grains give the highest tensile strength and stability for the board. The designers have taken maximum care to ensure firm grip for your two feet, when your body is perfectly balanced position. The deck has the capacity of supporting 250LBs weight and distributing it uniformly along the entire body of the board. The middle and bottom parts of the board contain aircraft grade aluminum integrated with the strong wood. Hence, the net weight of 15+ pounds is able to carry more than 16 times its weight without wilting. You can find an improvised version of the board on the Atom Electric B.36. The design on the skateboard deck is highly innovative and fabulous. The color combination of black and grey with a bear symbol looks simple, yet impressive. The bottom layer has a simple abstracts design, which is mostly covered by the battery. The forward/reverse switch is easily accessible to your foot onboard top surface. The Go button is at the front end of the board, while the stop button is right behind the Go button. The onboard controller also contains a direction changing control, which connects with the remote in your hand. This control called the tail can help turn to any side through a maximum of 90degree angle with reference to the horizontally forward direction of the wheel. The wheel size of the Acton Blink S2 is 83mm with 78A-hardness parameter. The front wheels connect to the bearing and the bushes through which the power passes into the twin wheels carrying the dual hub motors. The wheels are strong enough to withstand the board and your bodyweight, since the net weight of the two transfers to the wheels. The impact strength of the wheels make them ride on tough road conditions; keep the durability longer than any other standard skateboard wheels. Regenerative braking allows the energy generated during the application brakes to travel back into the battery. The installation and configuration of the Action Blink S2 app on your phone is a simple procedure. You just need to download from the authorized website and follow the guidelines. Input the serial number specified at the bottom of your board and click on the CONNECT button. The screen shows you the battery details, speed, mode, and other related information. The button on the left top controls the front and rear lights on the skateboard. You can control the inclination angle up to 20% from the horizontal plane. The app shows you a list of weekly challenges, number of trips made, distance travelled, and the other Action Blink S2 riders in your region. You can get connected with them when you turn on the “Location Services” in the app. The ranking page shows your position among the other riders with reference to the speed, distance, and other performance parameters. Customizable App for complete board control. 3 modes operation for beginner, intermediate and professional skaters. Top traction with smooth ride. Comfortable stance on board. It gives you perfect body balancing on board while traveling at maximum speed. You can also control the Action Blink S2 through the remote system in an efficient manner. Board weight of 15LBs is stated to be relatively high. Efficiency of regenerative braking gets reduced when the battery is low. The skateboard cost is stated to be relatively higher. The Acton Blink S2 has the most optimum design and performance parameters for users from the beginner to the pro levels. So, you may not to opt for another skateboard unless you wish to have a different experience. 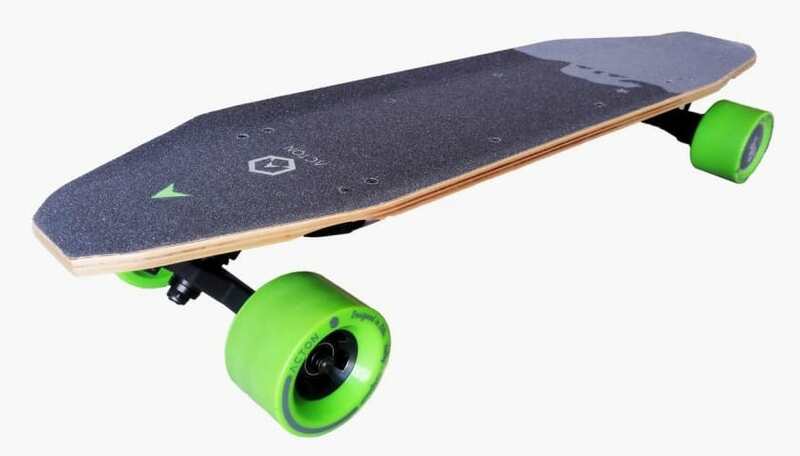 If you wish to find an economical skateboard for beginners, you can read the reviews on the Acton Blink S.
Copyright © 2019 RogerSkateboards. RogerSkateboards participates in the Amazon Services LLC Associates Program, an affiliate advertising program designed to provide a means for sites to earn advertising fees by advertising and linking to Amazon.com. Amazon and the Amazon logo are trademarks of Amazon.com, Inc. or its affiliates.